In my previous blog I wrote about how we approached change in order to reduce the ongoing crowding in our emergency department (ED). This blog focuses on the practical things we implemented to improve flow. I am often asked what's the one thing we did that made the biggest difference to our performance. The unfortunate answer is there wasn't one thing. There are services we should all have in place but they need to be tailored to our individual situations and capabilities. It's only by focussing on hundreds of incremental changes and making the whole hospital focus on improving flow that we can make our system work better. No change is too small if it can help patients flow through the hospital with less delays. Surprisingly, whilst we’d previously externalised many of the urgent care issues we faced, a huge amount of opportunities lay internally. In order to create all these changes we needed buy-in from every department in the trust to think about how they can make a difference. We did this by regularly communicating across the hospital about how we were doing on flow and embedding it as a core priority for every department. Flow's relevance to every department is undeniable: from outliers on surgery wards; to cancelled operations; to managers dreading another on-call; bad flow has consequences for the whole hospital. Our patient flow strategy pictured below was developed iteratively over a couple of years and tried to simplify the many national directives we were given whilst learning from best practice. It did this by allocating a specific theme for operational change to each day – a technique I pinched from time spent shadowing a friend of mine who was a manager in M&S. The idea of each day's theme was to be a reminder, a call to arms, to improve that process. There weren't project plans for what we would do but a series of small trials to see if changing x would make a difference. Initially we introduced ‘Morning Monday’ as there was always crowding due to the deficit of discharges over the weekend and surge of admissions on Mondays. Then came next step Tuesday where we reviewed every patient in the hospital to ensure they were receiving their next step via a director walk-around and discussions with our clinical teams. Gradually we identified a theme for every day through a process of trial and error and discussions with our operational and clinical teams. The strategy's implementation was led with enthusiasm by Mandy Carney, Associate Director of Urgent Care, and our excellent patient flow and clinical teams. 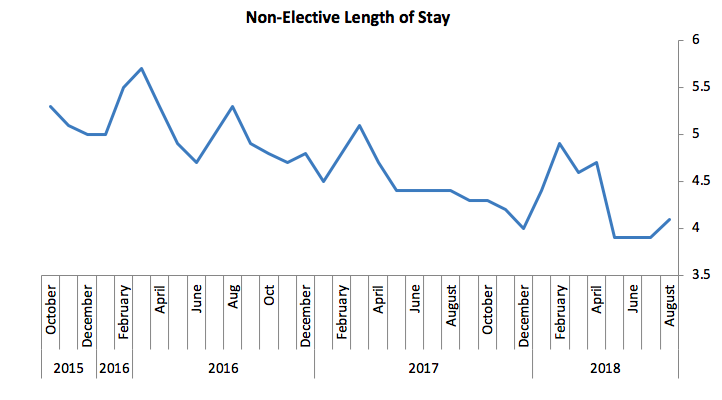 The outcome was dramatic: as you can see in the chart below our length of stay has fallen by around 20% for non-elective patients. As we started our work on reducing length of stay, we were still experiencing capacity pressures and crowding in ED. During all the pressures we’d faced Julie Reeve, Nurse Consultant for Emergency Medicine, and a small committed team had been trying to set up an Ambulatory Emergency Care service. Initially it operated out of a small bay at the back of ED that was constantly used for admissions. Lacking the staffing and space it needed, the service had struggled to have the impact they knew was possible. I remember being in ED on a bad day as we struggled with a high number of medical admissions. Julie approached me and said patiently “you realise of course, we wouldn't even need to admit a lot of these patients if we had a proper AEC.” Over time Julie’s suggestion struck home and after a challenging process of negotiation we created a fully functioning 7-day ambulatory emergency care unit (AEC) with all admissions treated as ambulatory unless proven otherwise. The AEC team transformed how we managed admissions and radically helped us reduce non-elective admissions onto the wards. They also helped embed a philosophy that “admission is not a plan” that has had knock-on effects across the hospital. The Somerset Home First project under the leadership of our Director of Adult Social Care Stephen Chandler and his team has helped us work collaboratively across health and social care to improve independence and reduce delays. The Symphony Programme involves local GPs and their teams reviewing our most complex patients, complex care teams ensuring those at risk of admission are supported to stay well, and the creation of a subsidiary delivering primary care at scale. Somerset Partnership - our community trust - have led the way in breaking down barriers and challenging assumptions around discharge. Under the leadership of their COO Andy Heron we've also introduced joint posts working across the hospital and community to help break down barriers and speed up processes. 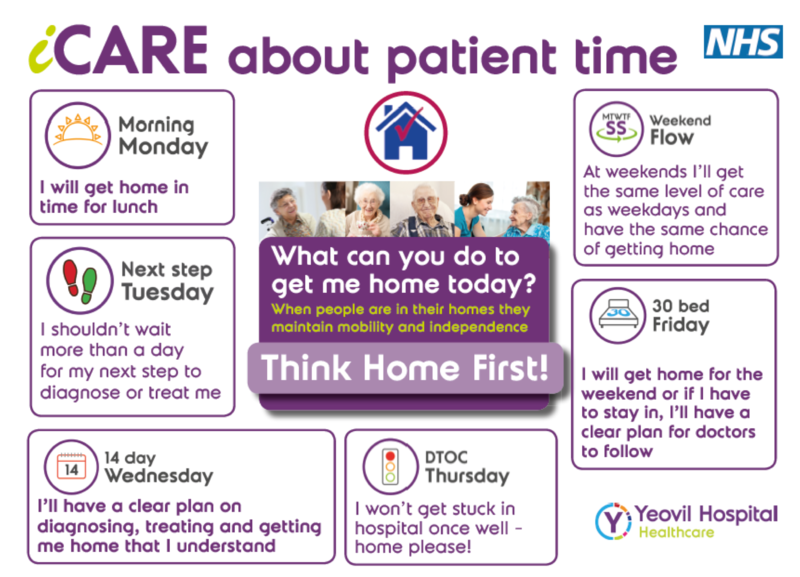 A partnership between our therapy teams, Cookson Court (a local nursing home), and the Council has reduced people’s longer-term care needs through intensively reabling people to get home. All these and more have ensured that Yeovil Hospital increasingly operates as part of an integrated system. We’re indebted to these partners for their trust and commitment to improve people’s experience of care. Patients don't care about organisational boundaries in the delivery of their care, and we're increasingly working to ensure the pathways they experience are as seamless as possible. The number of changes we’ve made are impossible to count and I've only been able to cover a few of them here. But every small change helps the hospital work better, improves efficiency and wastes less patient time. That said, reducing internal delays, maximising ambulatory pathways, and working with partners to help people stay well and get home have been big factors in our improved flow.